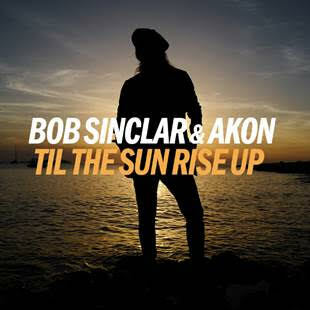 World renowned French DJ Bob Sinclar returns with singer/songwriter/producer Akon for a much anticipated single ‘Til The Sun Rise Up‘ accompanied by the offical music video (WATCH HERE) out today via Big Beat/Spinnin Records. The true feelgood party tune – which has mesmerized crowds all summer long at Sinclar’s Paris By Night performances in Pacha Ibiza – celebrates his trademark: using the Frenchman’s positive vibes and melodic approach in a sweet, catchy piece of dance music, perfectly incorporating Akon’s recognizable vocals. The DJ, producer, international man of mystery, and owner of the label Yellow Productions, Bob Sinclar, has gained acclaim behind the scenes for production on Dimitri From Paris, Kid Loco, Salome de Bahia, Michael Calfan, and Erik Hagleton records, among others. Since 1998 he has produced seven studio albums, scored worldwide hits with unforgettable tracks like ‘Love Generation‘ and ‘World Hold On‘, and collaborated with many different artists, going from Snoop Dogg, Sean Paul, Pitbull and Shaggy to Lionel Richie, Sophie Ellis-Bextor and The Sugarhill Gang. Last year also saw him enter a new chapter, with his hit single ‘Someone Who Needs Me‘, a track bursting of upbeat vibes and positivity. By now, it’s his most played record on Spotify, counting over 20 million streams already. ‘Til The Sun Rises Up’ featured artist, Akon, is best known for his 2005 breakthrough hit ‘Lonely‘ among other hit tracks like ‘Smack That‘ and ‘Beautiful‘, having sold multiple platinum albums and singles in a career spanning over a decade, working with the likes of Eminem, David Guetta and Snoop Dogg in the process.